The organized monastic presence on the Island of Valaam dates back over 1,000 years, prior to the Baptism of Russia (Rus') in 988. 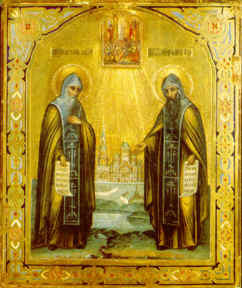 In the 9th century two monks, St. Sergius and St. Herman the Miracle-Workers (shown in the icon to the right), came to Valaam and founded the Monastery of the Transfiguration of the Savior, which still is functioning now. The treasured relics of these saints are in a large beautiful reliquary in the main cathedral of the monastery today. 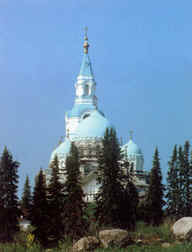 Valaam has long been a place of enormous spiritual significance and influence. For many centuries it was a spiritual center of northern Russian Orthodoxy, in much the same way as Mt. Athos has been a spiritual center for Mediterranean Orthodoxy. For this reason, Valaam has been known as the "Northern Athos." Valaam has contributed to the spiritual formation of numerous Russian saints, who spent some formative years at Valaam and then later became founders of major monasteries all over Russia. 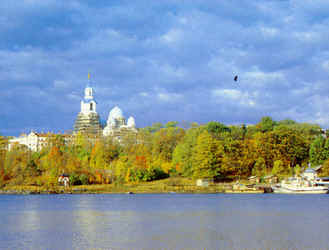 The spiritual light of Valaam has long attracted pilgrims, just as the Holy Trinity-St. Sergius Lavra Monastery, the Optina Pustyn and the Diveyevo Monastery have, except that, as an island, it is more isolated, and thus has long been a haven for those seeking a life of solitude and prayer. St. Herman of Alaska and his nine fellow monks, who came to Alaska's Kodiak Island in 1794 to serve as the first Orthodox missionaries to North America, had come from Valaam. (See our SAINTS' LIVES ARTICLE, The Life of St. Herman.) 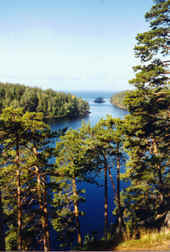 St. Herman called his hermitage on Spruce Island, near Kodiak, "New Valaam." Valaam (photo to the left) and Spruce Islands look and feel amazingly similar. "Valaam" is the name of both the large main island (shown in the map to the right), as well as the archipelago of about 50 islands of various sizes, in the northern part of Lake Ladoga (LA´-da-ga), which is the largest lake in Europe. The Valaam Islands are about 135 miles northeast of St. Petersburg, in Karelia, near Finland, that in previous centuries had been under Sweden. Today, large over-night cruise boats make the 135-mile trip between St. Petersburg and Valaam in about 11 hours. The lake is so enormous, it is like being on the ocean. In addition to the main Transfiguration Monastery, there had been many sketes and hermitages, with their churches and chapels, some of which have been rebuilt, or are in the process of being rebuilt, although most of the hermitages and small chapels no longer exist. Life for the monks of Valaam has always been difficult. In addition to the natural austerity of life on such a remote island so very far north, the political difficulties have been far worse. Located near the border of Russia and Sweden, in earlier centuries the monastery was frequently raided and demolished by the Swedes. 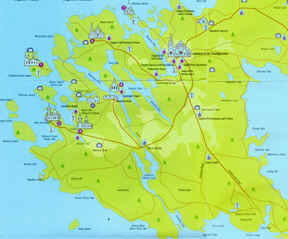 In the 17th century the monastery was completely destroyed and for 100 years the islands were under Swedish rule. After the defeat of the Swedes by Peter I at the beginning of the 18th century, the monastery was revived, and by the middle of the 19th century, it had become one of the most influential and famous monasteries in Russia. Most of the buildings still standing today were constructed in the 19th century, especially by the Igumen (Abbot) Damaskin. By the beginning of the 20th century, in addition to the main Transfiguration Monastery [photo to the left], there were 13 sketes and numerous hermitages throughout the islands. (A skete is where a small group of monastics live a stricter life than in the larger [cenobitic] monastery.) In the late 19th century the monstery had about 30 workshops and small factories, plus a sizable farm, so that the monastery could provide itself with everything it needed. It even had studios for icon-painting, art and photography, plus an outstanding library. But prayer always came first: they followed very strict monastic rules, and sang the ancient Znameny chant during the unhurried, beautiful, prayerful and peaceful Divine Services. From 1811 to 1917 the Valaam archipelgo of islands belonged to the Grand Duchy of Finland, a part of the Russian Empire. After the 1917 Russian revolution, Finland gained its independence. Consequently, unlike most Russian monasteries, Valaam was neither destroyed nor closed, and it remained a living oasis of Holy Russia between 1917 and 1940. However, in 1940, after a war between Finland and the Soviet Union, Valaam was returned to the USSR; the monks evacuated Valaam to avoid Soviet persecution, and established a "New Valaam" in Finland. During the Soviet period the monastery buildings were used as a naval school and then as a home for the disabled — the first secular residents of the island. Secular residents still live there (as of 1999), even in the apartments in the outer walls of the main monastery itself, but the monks help the residents and provide religious education for the children. 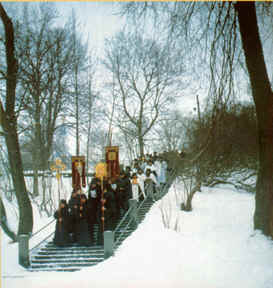 After almost 50 years, finally, in December 1989, monastic life was restored to Valaam, and since 1991, Valaam has been directly under the Patriarch of Moscow, who appoints the Abbot. In 2000 there are more than 100 monks and novices at the monastery. They follow a very strict monastic rule. The sound of the hauntingly beautiful ancient Znammeny chant, that had long been a part of Valaam tradition, is being heard once again. Many pilgrims come to the island, especially for the feast days of Ss. Sergius and Herman in July and September, and for the Transfiguration feast in August. Patriarch Aleksei, of blessed memory, frequently came for these special feast days, because Valaam had played an important formative role in the Patriarch's life as a boy, where he went on pilgrimage with hiis father. In July 1996 Metropolitan Theodosius, who aat the time was the Primate of the Orthodox Church in America, accompanied Patriarch Aleksei to Valaam, where he presented to the Abbot, Archimandrite Pangratii, a portion of the relics of St. Herman of Alaska. Today these relics are in a full-sized reliquary at the foot of a large icon of the saint on the left front pillar, by the center-front of the nave, as seen in the photo to the left. St. Herman and his nine companions had departed from Valaam in 1793 on their journey to America as missionaries. By presenting the relics, Metropolitan Theodosius was recognizing Valaam's contribution to Orthodoxy in North America. His Beatitude said: "Valaam Monastery holds a very special place in the heart of the American [Orthodox] Church. From this venerable center of prayer and asceticism, located on Lake Ladoga, the core of the first organized mission to North America was formed....Valaam is a spiritual link between our two local Churches... manifested in the person of our Venerable Father Herman."